I found time to watch two movies tonight. These were some of the movies my friends and I were planning to watch on Valentine's Day. Unfortunately, there had been change of plans due to unexpected classes. So I watched it myself. I'll begin with the one I least liked. The Art of Getting By stars Freddie Highmore (Finding Neverland, Charlie and the Chocolate Factory) as George, a lonely and fatalistic teen who's made it all the way to his senior year without ever having done a real day of work, who is befriended by Sally (Emma Roberts - Scream 4), a beautiful and complicated girl who recognizes in him a kindred spirit. Charlie [and the Chocolate Factory] meets Nancy Drew. That’s pretty much how I saw it in the beginning. 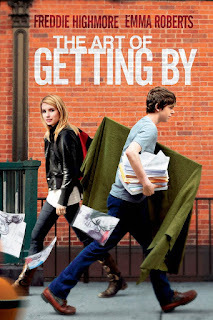 Freddie Highmore and Emma Roberts teaming up for a movie that I really did not quite internalize. Honestly I felt like there’s a deeper meaning to what I actually saw but I just couldn't grasp it. I got bored a few times with the story. But I did enjoy watching Freddie and Emma on screen. * Does anybody feel like Freddie still looks like that goody-goody little kid who won the 5th golden ticket to Willy Wonka’s factory? I guess I still see him like that. He has almost the same face as before, just a deeper voice and way way taller. It’s like little Freddie in a tall lanky body. Emma’s face hadn't changed much as well. Luckily, the adolescent stage was very nice to them. ** Yeah, not much comment on the movie. I did like George’s witty intelligence and his weirdness. Let’s stick with that. *** Ooooh!!! By the way... EMMA ROBERTS will play LENA HALOWAY in the TV SERIES ADAPTATION of Lauren Oliver’s DELIRIUM. Tiger Beat teen idol Jesse McCartney takes the title role in writer/director Todd Kessler's drama about a second-semester high-school senior named Natalie (Elisabeth Harnois), who believes she has life figured out until happening upon Keith, a troubled and unpredictable youth who begins to alter her perspective in ways she never thought possible. Keith is based on author Ron Carlson's short story of the same name. It was actually pretty good. Though if you try to think about the story, it kind of reminds you of the plot of another movie starring a Hollywood singer. Anyway, back to Keith. 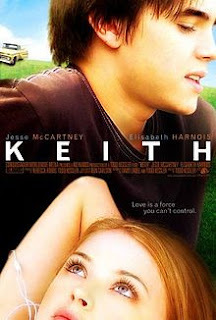 Jesse McCartney plays Keith in the movie, a senior that acts like he does not care about anything in the world except his truck. He is suddenly paired up with Natalie in their chemistry class. She is smart, beautiful and quite popular. Their story starts there. There are a lot of things I just like to comment on. First of all, Natalie. I don’t like her that much. She’s complicated and kind of annoying. She wasn't appealing in the beginning, but through the end, she eventually aligns herself. Next, the dialogues. Hmmmm... It does not have a lot of powerful lines that will make a mark on the people. And some of the lines delivered that should have made an impact to the viewers were a bit weak. Then, the trailer. PLEASE, if you do not want to spoil your watching experience, PLEASE DO NOT WATCH THE TRAILER. I watched it before I saw the movie and I kinda already know what’s going to happen in the end. Or maybe it’s just me. But still, I warn you. Jesse McCartney was quite impressive in this movie. I’m not the best judge for acting skills, but I guess I can say that I liked how Jesse portrayed Keith’s character. He was actually great (based on my screwed up judgement biased by my teeny crush on Jesse). So there!!! Keith everybody! A tear-jerker for some but not for me. It was touching and very emotional. Great!! !